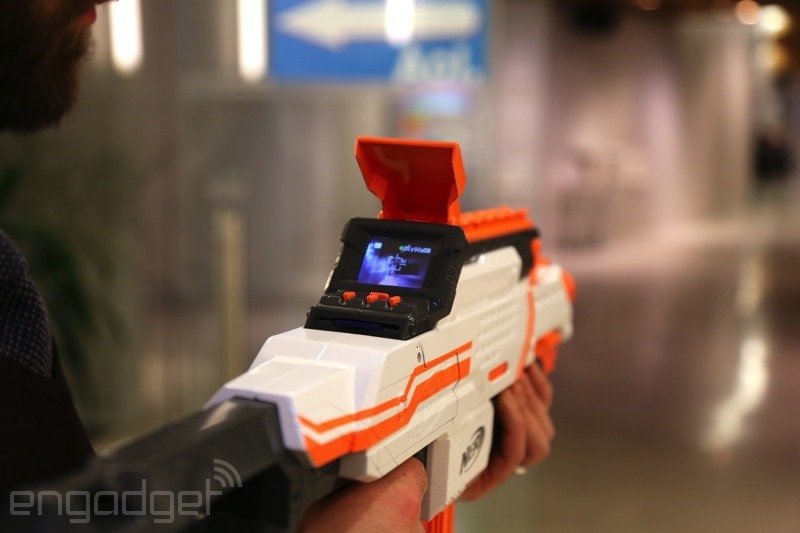 Today, Engadget premiered photos and video of the upcoming N-Strike Elite Cam ECS-12 blaster, a prototype blaster with a built in camera allowing you to record video and take photos. 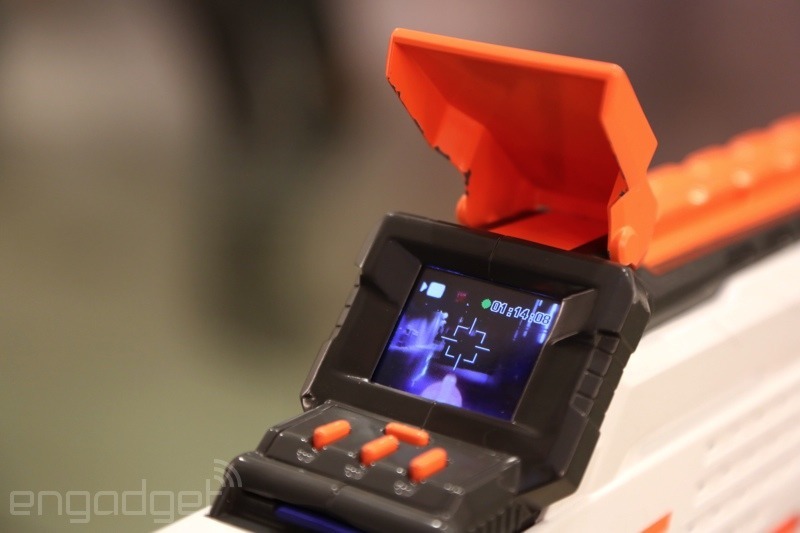 This is the first Nerf blaster with a built in camera, although you should take that with a massive grain of salt because the camera quality is 0.3 Megapixels (photos) and 20 Frames per second (video). Theres a video sample on the Engadget site and the video quality is not good to say the least. It will come with a 4 GB SD card out of the box which will allow you to save your photos and videos on it. The screen size is also on the small side, according to the site it’s 1.77 inches big. Blaster runs on 4 AA batteries, and the camera runs on 4 AA batteries for a total of 8 AA batteries. The battery life should give it a total of 3 recording hours. Operation wise, it performs pretty much like a Stryfe. Hold down the acceleration trigger, and then pull the firing trigger to fire the blaster. It is a semi automatic, so it will fire as fast as you can pull the trigger. The photo above shows the normal 12 dart clip going around, but Nerf plans on making an exclusive Clear 12 Dart clip (like you see in the top most image of this post) to go along with the blaster. 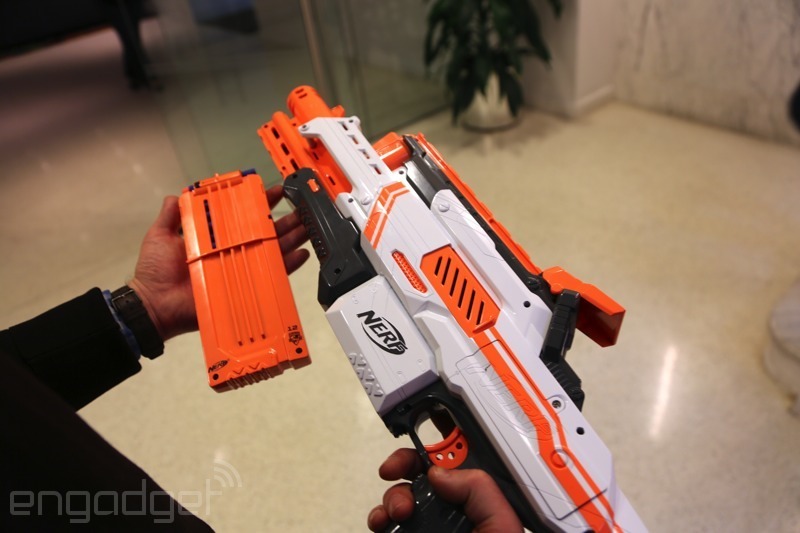 Nerf also plans on adding blue trim to the blaster. 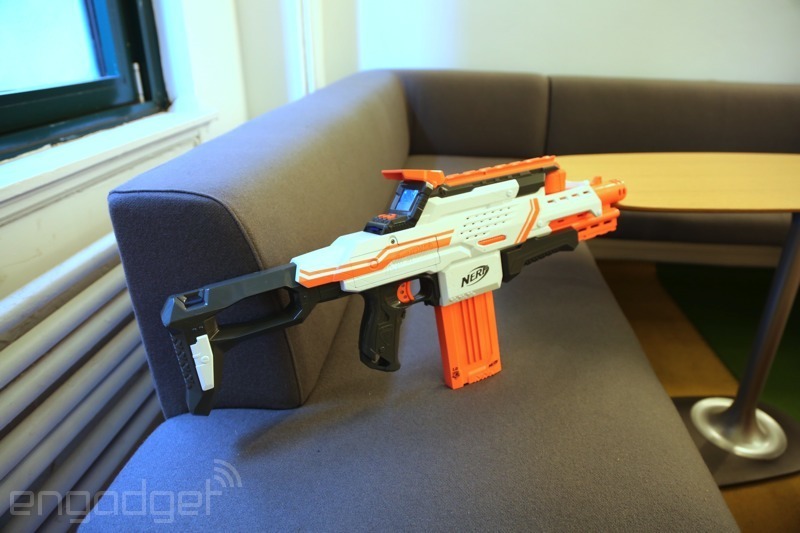 Engadget also says that their getting up to 90 feet with the blaster, but I’m willing to bet it’s actually closer to the Demolisher 2-1 Blaster 100 feet press description revealed to us recently. This blaster should also retail in the Fall in the USA for about $75. My initial thoughts are that I’m not too impressed with the blaster, and that some of the negatives are a bit too much. But I’ll sleep io it and try to get up a more thorough initial thoughts post or video in the near future. You can vieiw the full Engadget article overview here.